Today we deal with the issue of duty trailer or the transport of goods by bicycle. Not everyone drives a cargo bike and this may afford an alternative to this is a bike trailer load, in this case, the transport trolley Burley Travoy. We look at the Burley Travoy test to handling, practicality, processing and assembly. Was supplied to the transport Travoy in a gebrandetem Burley box with Logo and picture of article. Slightly lifting the box high, the content of which is in a box and can not move even by shaking. After opening the box, we look directly at the Burley Travoy. Tires and trailer hitch will be with, but have not yet mounted. The bike trailer pulled out of the box, it goes directly to the assembly. In addition to a user manual, a hex key and risers are in a box. drawn from the box, the loads trolley is wrapped in a bag, here we pull it out and see that the trolley is folded. The assembly works as far as the use of tools. Even the tires are fitted by locking them to the trolley. Balls in the axis provide the appropriate support. The handles one uses to to pull the trolley and on the other to the Travoy unfold and bring it into the correct shape. For all of these steps no tools are required. The caps can be removed by hand. Only a pair of scissors or a knife to open the carton makes sense. Full unfolded it can now be attached to the supplied tow bar. 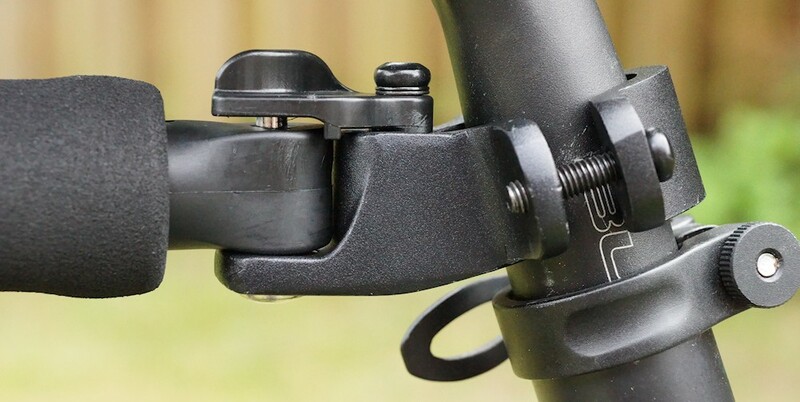 This must be fitted to the seat post by means of tool, because the package of Allen needed, however, lies in, no external tools for mounting equipment. The trailer coupling makes a solid and stable impression, that’s the downfall to her. Here want Burley that we fasten metal to metal, and is unfortunately no spacers made of rubber or plastic with the hand. 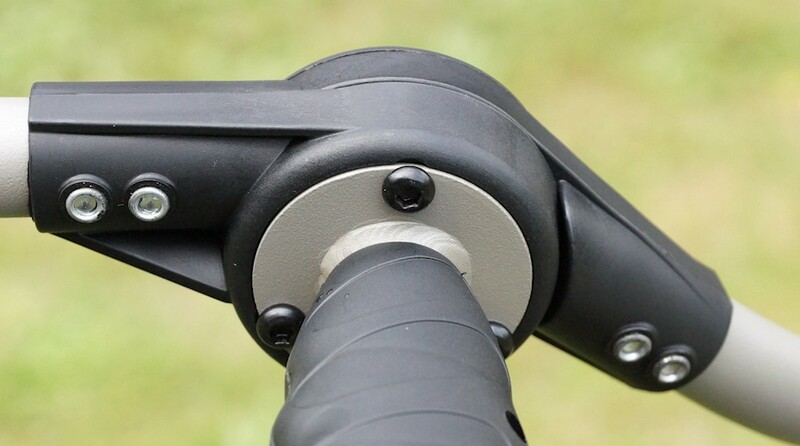 Our seatpost is matt lacquer, we tighten the screw of the bracket to which paint is thereby get damaged. 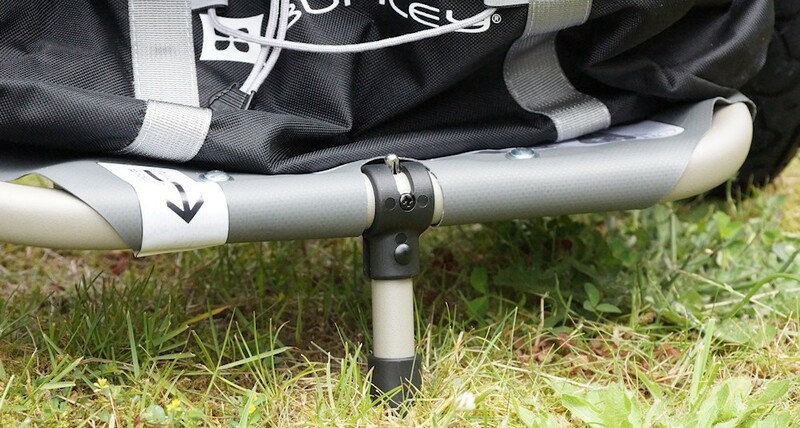 Our tip: Cut 1.5cm old bicycle tube and put it over the saddle bar, then attach the tow bar. Later the handle / the pole is hung in the clutch. Therefore one must push in the clutch, the lock to the side and hang the trailer drawbar from above the cotter pin. This happened without great force. If the tiller mounted correctly, the safety latch closes automatically. A ball coupling would have liked better, more on that later in the conclusion. The processing makes a solid and good impression. Despite the relatively low weight nothing seems cheap or rickety. The connections between different materials have no game.Surpluses or sharp edges in vain. The tarpaulin stretched between the frame is fastened with rivets. The aluminum tubes are riveted on plastic connectors. Here Burley has equal killed two birds with one stone. The storage bag is also a carrying bag and can be mounted with eyelets on duty trailers. Simply locate and use, even the bag at 4 points is fixed and can be loaded. This bag is of course no need here is also to the risers and straps otherwise be secured cargo. The tires are filled with air, this is both good, but also carries the risk of a flat tire. From Value Solid tires would likely have been a compromise. Is important to note that no person may be transported with the trailer. The load should be considered. 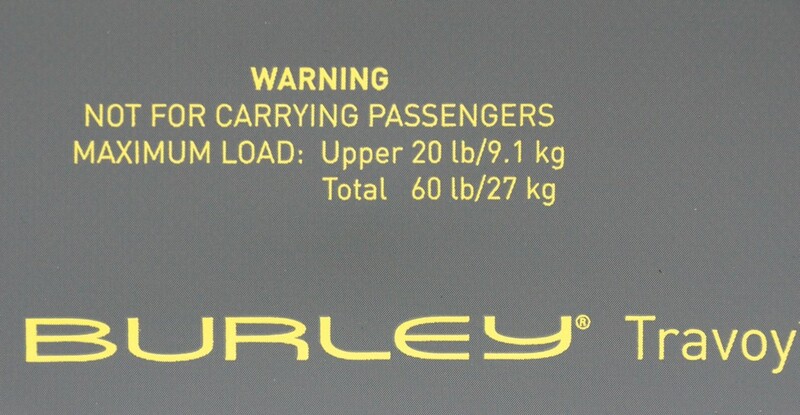 Not to forget, the higher effort when driving, the more weight is loaded on the trolley. We see the trolley wherever bike but breaks forth the goal of not coming on with the wheel.This may be the port on the way to sailboat. The low weight and space-saving storage disturb not on the boat. On the Golfpatz — Really? Even on the golf course makes the Burley a good figure, this may sound unusual at first, but we wanted to give him a chance. 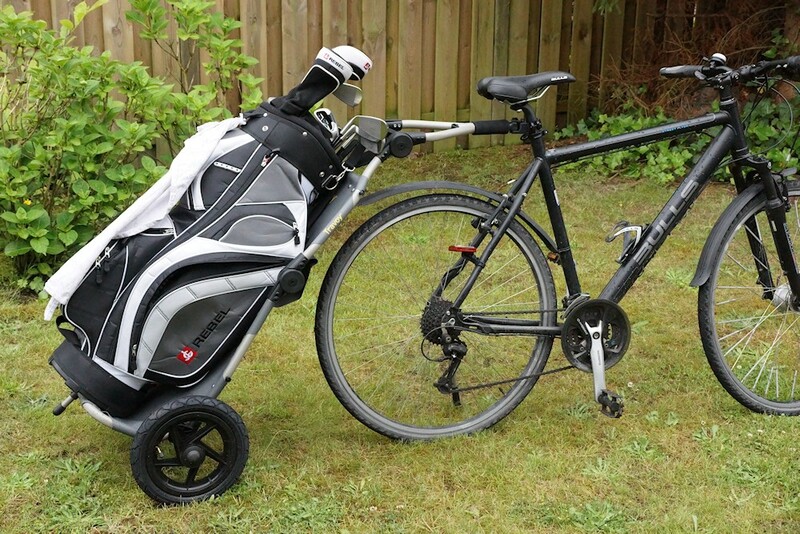 Those who do not suffer from it having to present his car as a status symbol, the pendant can also be perfect as a golf trolley use. We can test it once and he reflected on the grass quite well because its tires are very large. In medicine, you would probably use these «off-label use» call. Of course, even the weekly shopping no problem and the transport of larger items that fit on the floor face her on the trailer. The large tires allow a fairly straightforward, the Travoy also stairs with «roll up». Step by step way to do this quite well thanks to the 12.5 inch wheels.Optimal for the city where you only heavy and cumbersome comes with the car forward. Also ideal for excursions on the lake or for the cycling holiday . 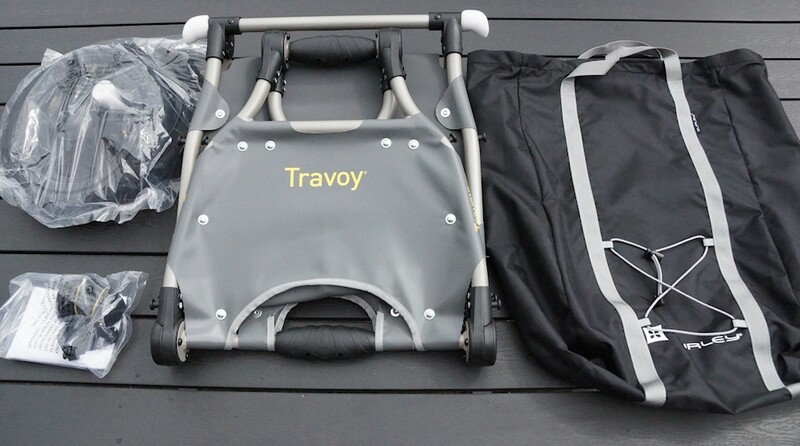 The Bruley Travoy brings with its maximum load of 27 kg use many possibilities. If you want to stand the trolley, so it stands on the two tires and a small foot. This walk can and show you. Since it does not interfere during the trip, we left him out there. For the trolley there are other bags as enlargement, all have the same technique for attachment. Hook and pull out. So you can adapt its individual daily needs of Transportable comfortable. The top pocket is a type briefcase and has a shoulder strap with it. Inside is a laptop case, the way to work is thus secured. Depending on taste, the briefcase can be used even without the trolley. The 20 liter capacity provide not only documents and files a place. The lower bag has a ventilation grille at the front. 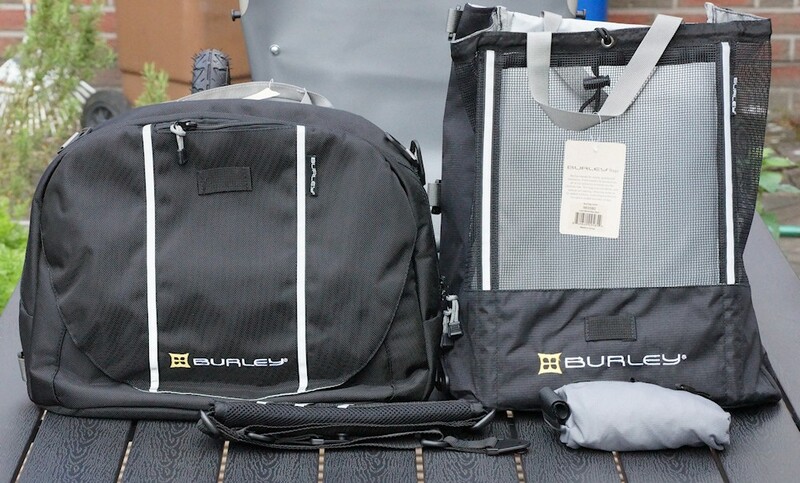 It is the Burley Bag and rich offers 32 liters of load capacity.When it rains, the rain cover protects for a dry transport from A to B.
are located on the bags from the bottom up ongoing reflective stripes. The we would have liked to seen the trolley itself. The loads pendant makes a good impression, with its 230 euro but also not cheap. Who wants to carry only 2-3 times a year loads, should consider an alternative. 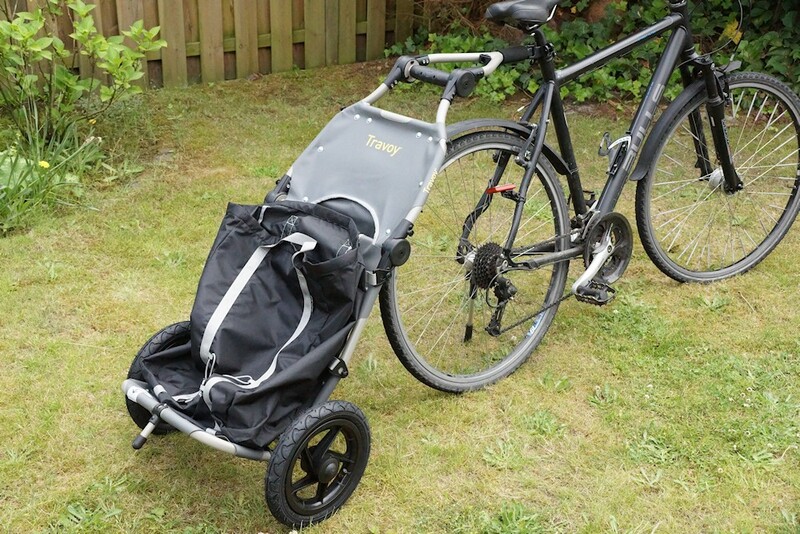 Who «more» with is often times on the bike on the road, found in Burley trolley a good partner to the loads take also to the places where you no longer get there by bike. Simple coupling and uncoupling and easy installation as well as the good processing points. Folded, it is quite small and fits into the included bag, this is a plus point. Deductions in the B-Note gets the towbar, as there is no paint protection has been provided. With the 56 cm track width, he is quite wider than the bicycle and can snag on corners or obstacles. To see other road users the trailer in the dark better mounted under the trailer load two reflectors. Tucked away for our liking. Here should be invested in reflective strips calm more.The trailer runs quite easily behind the wheel, however, one should never forget its width. It certainly is not bad if you have an extra bike lights mounted on the trailer. The towbar could optimize. 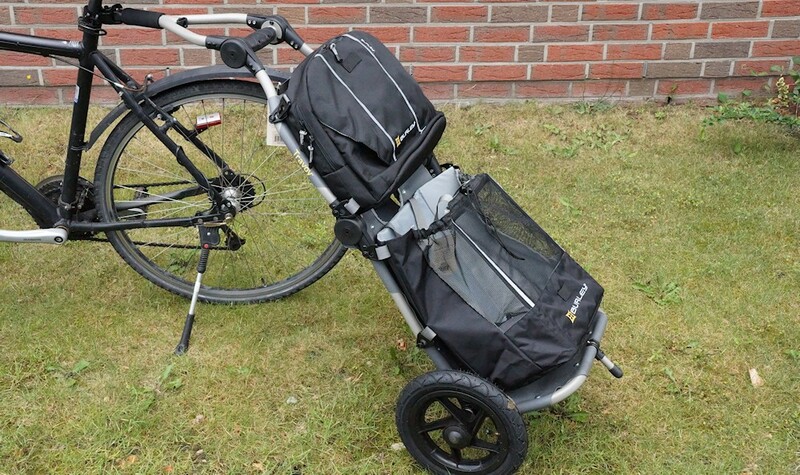 In Burley Travoy test we have the trolley behind a 28-inch bicycle.However, smaller wheels have a problem, because the trailer coupling with the pin can not be adjusted in angle. Even the tiller head kan be unobstructed. So you have to take care that the trailer hitch is mounted at the correct height and the angle of the cotter pin with the hole in the drawbar is not too large. The trolley fits perfectly into the trunk and must not be towed forcibly behind the bicycle. 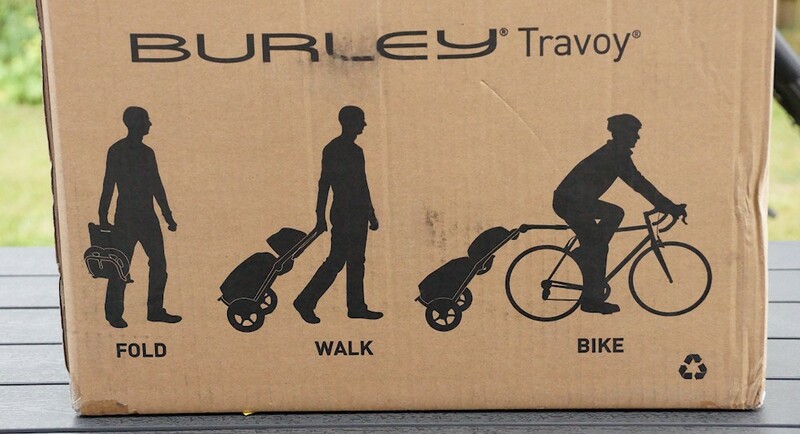 From us the Burley Travoy receives an overall rating of 4.2 out of 5 stars and cuts thus starting with GOOD.